This year’s SAWC Spring in San Diego attracted over 2000 attendees and 200 exhibitors. Amongst the many great presentations, Dr. Greg Schultz’s and Rosemary Hill’s particularly stood out. Dr Schultz (University of Florida, USA) presented in the Science and Technology section: Understanding the Wound Healing Process: What’s Known, What’s New. The lecture focused on the latest technologies to explore, measure, quantify and characterize the specialized cells, signals and processes involved in wound healing. The MolecuLight i:X was featured as one of the key devices to consider for wound care clinicians. 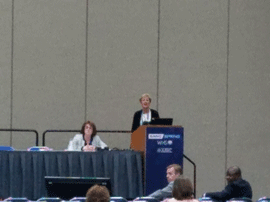 The theme of visualizing bacteria continued with Rosemary Hill (Vancouver Coastal Health, Canada), who presented ‘Real-time Bacterial Fluorescence Imaging Guides Antimicrobial Stewardship in Patients with Diverse Wounds’. Rosemary also presented a poster entitled: Effect of Bacterial Fluorescence Imaging on Patient Care and Wound Management in a Hospital Setting: A Pilot Study. All presentations highlighted how, along with clinical signs and symptoms, the MolecuLight i:X helps wound care clinicians guide debridement, sampling and treatment selection. 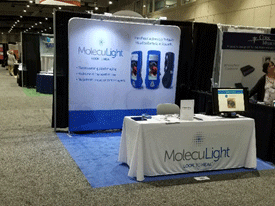 The MolecuLight booth was very busy during the exhibit times. After such compelling clinical presentations, wound care clinicians were especially interested in learning more and getting a close up view and hands-on experience with the MolecuLight i:X.